I love avocado – the texture, the taste, the versatility. And to me the ultimate comfort food is a mega sandwich of soft white bread with heaps of avo, slices of boiled egg, chopped tomato, salt and freshly ground pepper. And these recipes are only a few of my favourite avo indulgences. It may seem as if avo is only an afterthought because it is added right at the end, but it truly is the hero of the dish – take it away and you will be stuck with a very ordinary plate. I stick to using avo as a fresh, uncooked ingredient. I know there are recipes for avo bread, avo muffins and some exciting things people do with cooked avo. But to me it does not make sense to try so hard to find methods to cook or bake something that obviously doesn’t want or need those processes. Nothing beats the taste and texture of fresh avo. Heat the oil in a heavy bottomed pot and fry the sausage until each slice has a nicely seared look. Remove the sausage slices with a slotted spoon and keep aside. Sauté the onion and garlic in the same oil until the onion is soft and translucent. Add the tomatoes, salt, pepper and paprika and sauté for a few minutes more until the tomatoes becomes soft and start breaking up. Add the stock, lower the heat, cover the pot and simmer for 10 – 15 minutes. Use a hand blender or food processor and make a smooth sauce. Return it to the stove plate and add most of the sausage slices. Keep 3 – 5 slices aside. In the meantime, cook the pasta according to the instructions on the package. Drain the pasta and add to the pot. Mix well so that all the pasta is covered with the sauce and the sausage slices are mixed through. Turn the mixture out on a serving dish and arrange the chopped tomato and avocado slices on top. Chop the remaining sausage slices into finer pieces and sprinkle on top. Enjoy! Heat the oil in a heavy bottomed pot or large pan and sauté the onion, garlic and red pepper chunks until the onion is soft and translucent. Add the rest of the ingredients and bring to the boil. Lower the heat, over the pot and simmer for 10 minutes. Use a hand blender or food processor to make a smooth sauce. Return to the heat and drop the meat balls gently into the sauce. Cook over moderate heat for 15 – 20 minutes or until the meat balls are cooked. In a large bowl, mix together the mealie meal, flour, sugar, baking powder, bicarbonate of soda, and salt. In a separate bowl, mix together the eggs, Amasi, and butter. Pour the Amasi mixture into the mixed dry ingredients and fold together until there are no dry spots (the batter will still be lumpy). Pour the batter into a 20 cm square baking tin, greased with butter and bake for 20 – 25 minutes in a preheated oven of 220⁰C. Mix the avo, onion, tomato and coriander together in a small bowl. In a separate bowl, mix the oil, lemon juice, sweet chilli sauce and salt and pepper until it emulsifies. Pour the oil mixture over the avo mix and carefully mix together. Divide the corn bread into 4 equal squares. Cut each square open to form a sandwich. Dish the meat balls with plenty of sauce on top of the corn bread and spoon a generous portion of salsa over the meat balls. Start by making the crust: Put the flour and salt into a large mixing bowl. Rub the butter with the tips of your fingers into the flour until it resembles coarse mealie meal. Add the water drop by drop until you have a soft pliable dough. Cover with cling wrap and leave in the fridge for 30 minutes. Roll out on a floured surface and line a flan or quiche tin. Prick the bottom all over with a fork, line with baking paper and cover with baking beans or rice. Bake in a preheated oven of 200⁰C for 13 minutes. Remove the baking paper and beans and bake uncovered for another 7 – 10 minutes. Leave to cool slightly before you take it out of the tin and cool down completely. Make the filling: Mix all the ingredients for the filling and spoon into the crust. 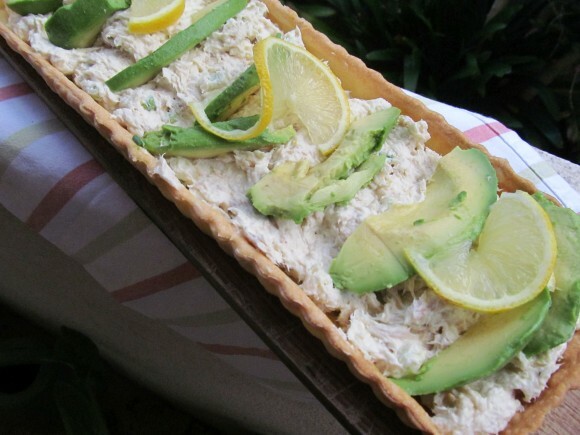 Arrange the avo and lemon slices on top. For the steaks: Mix the olive oil, balsamic vinegar, brown sugar and salt and pepper and pour it onto a shallow plate. Dip the steaks in the mixture so that it is covered with the marinade. Leave the meat on the plate for about 10 minutes. Heat a steak pan and fry the steaks for about 2 – 3 minutes on each side. Cut the steaks into strips and season with salt and pepper to taste. Cover the pan with foil and leave to stand for about 20 minutes. Put the leaves in a salad bowl and arrange the grapefruit, avo pieces and steaks strips on top. Mix the ingredients for the vinaigrette and sprinkle over the salad. Serve immediately.